IN the early days of their stay on the hill the Maharshi and his disciples were menaced by insects, monkeys and other animals. 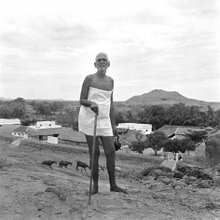 Yet the Maharshi told his disciples that the hill was the territory of the animals and that as guests there it was their duty to ensure that no harm came to the animals on their account. It is said of sadhus that they extended protection to all living beings (abhayam sarva bhutebhyah). This saying applied to the Maharshi who protected even poisonous insects. Deadly scorpions stung him on three occasions but nothing happened to him. attacked the snake. Also, quite surprisingly, the snake would join the peacocks in their dances. Squirrels, crows and other birds also would show a natural affection for the Maharshi. The latter, in turn, would feed them. A particular crow used to leave its young ones in Bhagavan's care and go out. The Maharshi would take the trouble of feeding them whenever they cried for food. There seems to be a natural affinity between monkeys and humans. Recall how the monkeys assisted Sri Rama in the Ramayana. Bhagavan was able to converse with monkeys and after a close observation of their ways discovered that they had a social and political structure or hierarchy. On several occasions the monkeys would go to the Maharshi with their disputes for arbitration. He would patiently listen to them and effect reconciliation among the contending parties. was a frequent visitor to the ashram and he would take quite a few liberties with Bhagavan. Nondi was quick to take offence; he was meticulously clean in his ways. Once, when Nondi spilled some rice on the ground the Maharshi scolded him. Immediately Nondi slapped him near the eye. As a punishment, the Maharshi became very cold towards Nondi for some days. But Nondi pleaded with him and found his way back to the Maharshi's lap. On an earlier occasion also Nondi had misbehaved. The Maharshi was once blowing hot milk to be given to Nondi but the latter thought that the Maharshi was going to sip the milk and slapped him. Soon after realising his mistake Nondi repented and got back into Bhagavan's good books. On that occasion Bhagavan was not hurt badly and that helped Nondi's quick rehabilitation. Making fun of Nondi, Bhagavan once said to him "You should not forget us when you become the Chief." By a strange coincidence Nondi did become the Chief of their group bypassing three senior members. Nondi was keen on being anointed in Bhagavan's presence and went to the ashram with his retinue but not finding him there spoilt all the trees of the ashram. came down and sat on the Maharshi's lap. Thereafter Nondi's predecessor in office came up and paid homage to Nondi. This confirmed Bhagavan's guess. At mealtime Nondi sat beside Bhagavan but refused to touch the food and walked away. Surprised at this, the Maharshi followed him. Nondi went and sat among his subjects, with his queens sitting closeby. (Among monkeys the queens of the previous king continued to retain their status even under the new regime). It became clear that Nondi would not partake of any meal without his subjects also being served. So, the ashramites, arranged a `royal banquet' for Nondi. A little later due to the machinations of his minister Nondi lost his position and began living apart from his group with his progeny. Two months after the Maharshi left Skandasramam and settled down at Ramanasramam, Nondi came searching for him and continued to visit him every fortnight. Once, an old monkey-chief became sick. He left his group and stood outside the Virupaksha cave. On coming to know this the Maharshi went out to look him up. He also noticed that two previous Chiefs who were expelled by that monkey were on two nearby branches grieving for their erstwhile Chief. The Maharshi took the sick one inside the ashram and nursed him but to no avail. While the old monkey was about to die the other two let out a cry of agony. The Maharshi arranged for the burial of the dead monkey with all honours due to a sannyasin. from this incident: The Maharshi and his disciples set out on giripradakshina on a hot day. By the time they reached the vicinity of Pachaiamman Kovil at midday they were tired and thirsty. A group of monkeys who noticed this, climbed on to a nearby tree which bore a number of juicy fruits and shook the branches. As a result, a number of fruits fell on the ground. The group of monkeys left the spot leaving the Maharshi and his party to enjoy the fruits. Possibly, the group of monkeys had received the Maharshi's hospitality earlier and it was their way of reciprocating. A tiger frequently visited a waterfall close to the ashram. He would usually growl to announce his arrival. The Maharshi would know it to be a friendly growl but his disciples would panic and make all sorts of noises to drive away the tiger. members were looked after with great care. The Maharshi took care of the food, bath and bed of these `children.' Great care was taken if any of these `children' fell ill. Also, appropriate functions were conducted in connection with the delivery, wedding or funeral of any of the animals. Kamala was the founder of the family of dogs, a family which was fairly large. The Maharshi knew the members of the different generations and each one of them bore a name. For facility we shall refer to them as 1, 2, 3 etc. The descendants of Kamala included Neela, Jack and Rose. A little before Kamala's end Bhagavan asked Rose to go and look her up. After Kamala passed away he consoled Rose. Chinna Karuppan: This dog was dark-skinned and came to be known as the Dark one (Karuppan), Karuppan was very fastidious. He would generally keep aloof and not mix with other dogs. He would stay close to the Virupaksha cave amidst bushes. Noticing his aloofness the ashramites would serve him his food at a short distance from him. However, one day as the Maharshi was on his way to Skandasramam, Karuppan leapt up and wound himself round the Maharshi's feet and played with great joy. Thenceforth he became a member of the ashram. Karuppan was intelligent, large-hearted and sensitive. At the ashram he mixed freely with the other members and played about with them. He even tried to play with those who were orthodox and resented any dog. prohibited. The disturbed Brahmin hit the dog with a stick. After that incident Karuppan never again stepped into the ashram. Extremely sensitive as he was, Karuppan disappeared altogether from the sight of those who slighted him. On an earlier occasion, a similar incident had occurred. On a rainy night, Palaniswami was rude towards Karuppan who at once left the place and lay on a bag of coals at Skandasramam. He did not return to the Virupaksha cave till he was specially invited. Palaniswami also scolded a pup once who thereupon jumped into a water tank and killed himself. On that very day, Bhagavan had told his disciples that those animals came to live with him to work off their karma [?] and that they should be respected. Yet sometimes his disciples did not follow his precept and were insensitive. On several occasions, the dogs Kamala and Seguppan were ordered by Bhagavan to take new visitors to different shrines and teerthas, which they did. Jack 1: This dog was both intelligent and obedient. Once the Maharshi set out on giripradakshina with his disciples by a short-route across the hill. He asked Jacki to go down the hill to the town. Accordingly, Jack left and was sighted by the Maharshi on its way down. Midway on their walk the Maharshi changed course and walked down the hill. As they were descending, Jack was returning from the town. The Maharshi then directed Jack to go back to the ashram. Though reluctant to leave Bhagavan's company, as an obedient fellow, Jack went back to the ashram. Jack was soft and austere in his ways. His daily routine was like this: early in the morning he would visit a devadasi's (temple dancer's) house for breakfast and then go to a priest's house to accompany him to the shrine at Guha Namassivaya. After that he would go to Virupaksha cave for Bhagavan's darshan and later to a resting place nearby. Around 9.30 in the morning he would visit the shrine at Guha Namassivaya for prasadam and get back to his place of rest. Again by evening he would visit the devadasi's house for food. After supper he would go to a math [?] to keep company with the priest. To the extent possible he would spend his time in the vicinity of Arunachaleswara, much like a yogi. In 1905 - 1906 when the plague broke out in the town most of the inhabitants of Tiruvannamalai left the place leaving it deserted. Leopards roamed about the streets during daytime. Bhagavan and some of his disciples stayed, at Pachaiamman Kovil during that period. Jack did not stay with Bhagavan but stayed with the priest at Guha Namassivaya. After sometime he left the place never to be seen again. The Maharshi looked upon the animals as sadhus. He ensured that they had their share of food before others in the ashram did. The Maharshi arranged for the proper burial of the ashram animals upon their death and in some cases erected samadhis. was about sixty in 1918 during the period when Bhagvan stayed at Virupaksha cave. (2) The `old lady of greens' (Keerai Patti): Ramana went to live on the hill in 1900. An old lady who lived at a corner of Guha Namassivaya shrine used to collect greens and cook them. One day she brought some greens for the Swami, the new arrival on the hill. The Swami partook of it and ever since the old lady began regularly serving the Swami. He also was a frequent visitor to her place. Not only that, he would, on occasion, help the lady in collecting greens and in getting them ready for cooking. The old lady had great mother-like affection for the young Swami. Devotees of Bhagavan believed that the old lady was reborn as the Cow Lakshmi who stayed at Ramanasramam. Bhagavan also appeared to subscribe to that view as may be seen from this: A devotee once asked Bhagavan whether it was possible for a human being to be re-born as an animal. Bhagavan's reply was, "Why not? Do we not have Lakshmi?" 3) Ayyaswami: Ayyaswami was a Malayalee who was endowed with great detachment like Uddandi Nayanar. For sheer service-mindedness he was unequalled. He looked after the upkeep of the ashram. He would be busy throughout the day and quietly go out into the town begging without anybody noticing him. This serviceable member of the ashram passed away quite young, in the same year as Keerai Patti.